I backup my system less often than I probably should (photographs aside, which get saved in at least 3 places regularly – I’m paranoid!). So perhaps I should take the time to have a go at this myself. Meri’s talk started with the Basic lifecycle of a project. Few projects go through the whole lifecycle properly. The Big Secret is that, for smaller projects, PM is all about Initiating, Planning & Closing (and not worrying too much about execution and control). Planning should NOT be about planning a step by step guide – but something that helps you understand what you’re doing. And communicating this to stakeholders. 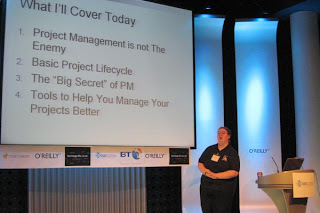 She also mentioned that lots of projects are not closed properly – haven’t we all been plagued by customers that just won’t go away but pester by saying “can you just do this bit extra?”. Then we talked about what we’d done and why. It was nice to get away from the computers for a bit, and everyone had fun explaining how they had implemented their solution to their neighbour. Robert Lee-Cann on Over-Engineering Is Fun! 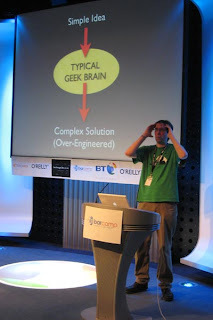 Leeky‘s presentation was a light-hearted and thoroughly enjoyable look at solutions to problems which have been hugely over-engineered, and he wondered if this was a typical trait of geeks in general? 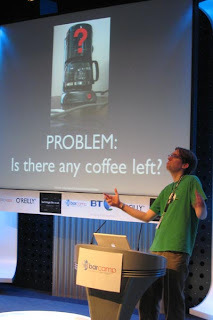 Problem: Is the coffee machine full? Problem: Who’s going to make the tea round? Geek Solution: Web-based ordering of drinks, LED display in the kitchen showing the round required, online voting afterwards to see how well it was made! John – set up a telly, Freeview box and video transmitter in one room and a reciever in the other room – when they could have run a cable through the wall! The final part was for the audience to come up with a solution to the perennial problem of putting the loo seat up or down in the bathroom. Many outrageous examples were put forward, which ranged from having a finger-print recognition pad on the loo door, so the loo “knew” who was about to sit down, to weight/position sensitive pads just in front of the loo, so it knew if gents were standing or sitting down! All great fun. 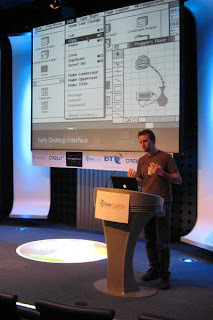 Andy started by talking about the early desktop interface, when abstracting the interface made it easier for “non-tech” users. At the time, it was revolutionary. Similarly, Joe Bloggs doesn’t want to learn Unix to use their iPods. People DON’T read the manual. No wonder we say RTFM so often. We learn by experience – programming DVD recorder is very similar to programming the video. So the building blocks are there and users learn the metaphores. It makes it important not to break common interaction habits. Users learn new technology by exploring – you switch it on and start clicking buttons to see what happens! So make buttons look like buttons. And make sure it’s not fragile so that inexperienced users can’t break the system with one click. Modern life constantly demands our attention. How easy is it to send a text while crossing the road? Rarely do people give your application 100% of their attention. Design it to make things easy, as people are adept at multitasking. t’s a great place to make the user experience a good one – as soon as something breaks, you want immediate service or fix, or at very least, a human-readable error message. Don’t make users feel stupid when they do something wrong. Usability is all about making technology easier to use. Plan user experiences carefully. 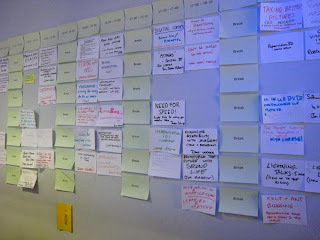 Create wireframe storyboards – think how filming is never done without paper mockups. Then test it on REAL users. Can be as simple as chatting to coffee shop customers – feed them donuts and buy them a coffee and get their feedback on your site – one day user testing, low budget – anything is better than nothing. UCD is sometimes confused with Business Centred Design or Marketing Centred Design. You should not have to deal with politics. But we all know how hard that can be. Designing with a focus on business unit function is also horribly bad. Technology Centred Design – designing around our own technical ability – we do it that way because we can – is also a no-no. Get out and talk to the users – find out what they’re trying to do with your site. Users don’t just want to know what the weather is going to do for the sake of interest, they are more likely to need to know if whether to take an umbrella with them today! Build up Personas for each broad type of user. Design with these in mind. Very easy isn’t always best – maintain a balance. 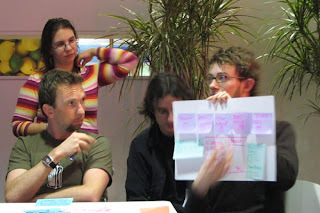 Sites or games companies know about flow – you lose time when you are interested in something. 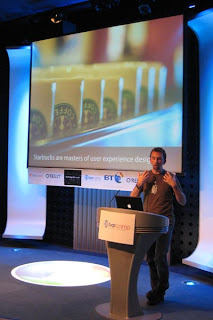 Starbucks are masters of the “coffee experience” – which is why we are willing to shell out 3 quid for a cup coffee! Lastly, he made the point that the iPod would probably fail user testing. People buy into the brand. You might struggle through learning the interface, but you’re willing to learn it because your friends tell you it’s a cool gagdet. So for the right brand, people are willing to take the time to learn new ways of working. 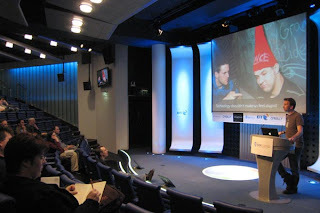 This entry was posted in barCamps, design, development, usability and tagged andy budd, backup, BarCamp, BarCampLondon2, blog design, geeks, leeky, leisa reichelt, meri williams, project management, robert lee-cann, tom scott, user centred design, windows. Bookmark the permalink. Thanks for your kind words. Makes all the stress and worrying worth it. Means I’ll feel more confident next time – yes, I’m quite looking forward to doing my next presentation wherever that’ll be.